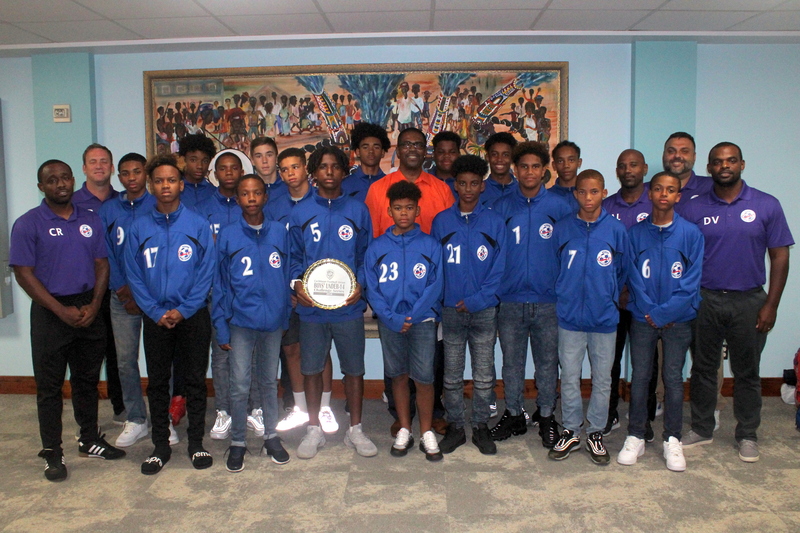 Bermuda’s Under 14 Boy’s Football Team returned home after finishing on top of the Caribbean Football Union Boys’ U14 Challenge Series Group in the Cayman Islands. The Bermuda team won all three of their matches outscoring their opponents 17 – 1. Bermuda opened the tournament picking up a 2-1 win over Cuba, they would then defeated the Cayman Islands 4-0, before closing out with a 11-0 win over the US Virgin Islands. The Bermuda team was met at the LF Wade International Airport by the Minister of Sports Michael Weeks and the Director of Youth, Sports & Recreation Norbert Simons. Also on hand was the Bermuda Football Association President Mark Wade, Executive Members as well as a large contingent of family and friends.